That was Yolo County Supervisor Don Saylor talking to The Sacramento Bee about the vote by the Benicia City Council to deny a new oil-by-rail facility that oil company Valero was seeking. But that vote would have been meaningless if not for a recent decision on September 20 by the Surface Transportation Board (STB) that gave Benicia the legal authority to have some say over what happens within its borders. The STB decision helped clear up some of the gray areas around the issue of “pre-emption,” in which railroads are not subject to any local or state authorities or laws because local and state laws are “pre-empted” by federal law. In 2013 the STB ruled in favor of Norfolk Southern Railway Company, saying once again that federal pre-emption of state laws protected the rail company from lawsuits filed in the state of Virginia. The basic idea of pre-emption is that for interstate commerce to work, the federal government needs to be the sole regulator of railroads. As we have reported previously on DeSmog, pre-emption can effectively place rail companies above local law. This has led to developments such as the case of Grafton, Massachusetts, where the construction of the largest propane transloading facility in the state occurred without the need for local approval, construction permits, or even environmental review. This above-the-law approach has served rail companies well. And until the recent STB decision, it also appeared to protect oil companies who were moving oil by rail. But this latest decision about Benicia appears to deliver a real blow to oil companies when it comes to oil-by-rail transfer facilities. Since the companies who receive the oil from the rail cars aren’t railroads, the STB ruled that they are not protected by federal pre-emption. In the decision the STB refers to Valero as a “a noncarrier” which is why the STB ruled they are not able to claim pre-emption. This allowed Benicia to say no to an oil-by-rail facility in their community. And it has also changed the discussion about this industry as a whole. 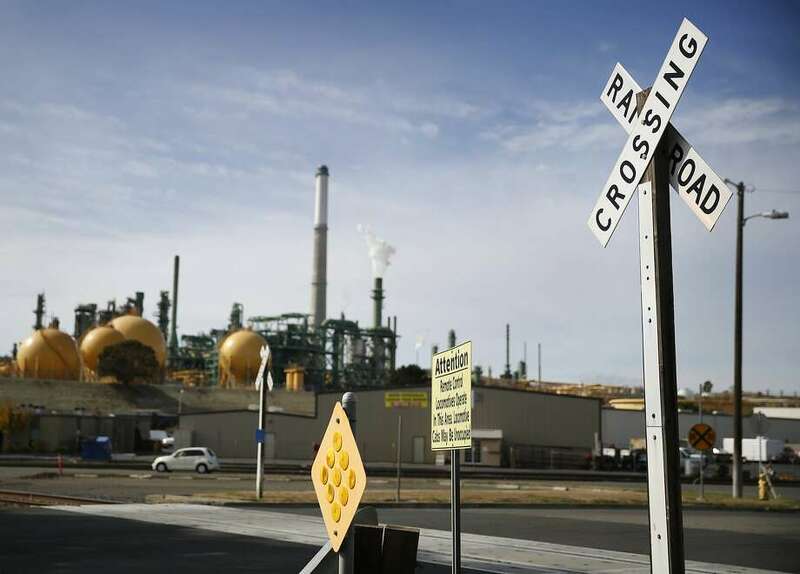 San Luis Obispo County, California, has now delayed further the decision about a new oil-by-rail facility in order to consider the latest STB ruling. Ethan Buckner was one of the organizers for environmental advocacy group Stand, which was working to stop the Benicia facility. Jackie Prange was one of the lawyers working on the Benicia case for the Natural Resources Defense Council and explained the potential impact of the STB decision to the San Francisco Chronicle. They are definitely paying attention in San Luis Obispo County, as well as in Albany, New York. Albany is the largest oil-by-rail hub on the East Coast. Opponents of its oil trains recently had cause for celebration. On September 16, the state’s Department of Environmental Conservation announced that the two companies operating oil-by-rail facilities at the Port of Albany would now be required to undergo full environmental reviews before the agency would renew the companies’ permits. Chris Amato is a lawyer for Earthjustice who has been working on this issue for years. He believes the STB decision supports what Earthjustice has been saying all along about Global Companies, which owns one of Albany’s oil-by-rail facilities. It would appear that the STB ruling negates New York’s current position and offers an option for the state to have authority over oil-by-rail facilities in Albany. While the amount of oil moving by rail is roughly half of what it was two years ago, that is mostly due to the current low price of oil. And it hasn’t stopped oil companies’ continued efforts to build out more oil-by-rail infrastructure. Meanwhile, oil trains continue to derail and explode, as happened in Mosier, Oregon, in June, and opposition to the oil-by-rail industry continues to grow. This STB decision appears to be a game-changer in the oil-by-rail story. With it, perhaps now more politicians will agree that “the safety of our communities matter” — much more so than oil company profits.